These Frequently Asked Questions have been prepared by NELA in response to queries received since the publication of the BPT documents by NHS England and NHS Improvement. Please check back regularly for new updates. If you have additional queries, please contact us. 1. What is the Emergency Laparotomy Best Practice Tariff? This is a split tariff that pays at a higher rate for Trusts that deliver care that is considered best practice. If care does not meet the requirements for the BPT, Trusts will be paid at a lower rate. The enhanced tariff will be paid if 80% of high risk patients have a consultant surgeon and consultant anaesthetist present during surgery and are admitted to critical care. 2. Why have consultant presence and critical care admission been selected as the BPT metrics? Whilst there are potentially many metrics that are important in emergency laparotomy care, some were less suitable for a BPT due to the baseline performance, or the numbers of patients involved. For instance, there are too few patients in the most urgent theatre category to be able to incorporate this into the BPT. 3. 80% of our high risk patients receive consultant delivered care, and 80% are admitted to critical care. Does this mean my Trust will qualify for the higher tariff? Not necessarily. 80% of patients need to receive consultant delivers care AND be admitted to critical care. The same patient needs to receive both elements of care. 4. How are "high risk" patients defined? High risk patients are those that have a predicted mortality of 5% or greater based on the NELA risk score, or considered high risk based on clinical judgement. Any patient who has not had a documented assessment of risk is also considered "high risk". This is a slight change from definitions of high risk patients that have been in place for the Year 5 patient audit (which runs from 1st December 2017 to 30th November 2018) and have been used for Year 5 quarterly reports, as this also included POSSUM risk score. We are aware of the potential discrepancy between NELA & POSSUM risk scores and clinical judgement. POSSUM identifies a patient as high risk, when NELA and clinical judgement identify the patient as low risk in less than 1.5% of cases. The current reports include this discrepancy, but as it is only occurs infrequently, still means the reports are indicative of current performance. From April 2019, NELA will be removing POSSUM from its mortality risk calculations. After this date, high risk patients will only be identified according to NELA risk score, or clinical judgement. In the absence of risk assessment, the patient will be considered as high risk. The BPT and NELA RAG rating calculations will not use POSSUM as a means of identifying high risk patients. The BPT only applies to high risk patients who are high risk pre-op AND post-op. 5. How is "Consultant surgeon/anaesthetist" defined? This uses the same definitions of consultant that are already used for NELA. Consultants are those on the Specialist Register and employed by the Trust as consultants in either permanent or locum positions. Post-CCT fellows do not constitute consultants. 6. How is "critical care" defined? This is defined as a recognised level 3 intensive care unit or level 2 high dependency unit. Enhanced recovery units (eg surgical observation wards, PACUs) are not considered critical care. These definitions are in keeping with those already used by NELA. 7. An agreed pathway for emergency laparotomy patients is required as a pre-condition for accessing the BPT. What does this mean? Clinicians will need to develop a pathway for their Trust that sets out how patients who may require an emergency laparotomy should be managed. This will need to incorporate a diagnostic pathway, and an emergency laparotomy pathway once it has been decided that a patient needs surgery. The pathway needs to be agreed by clinicians potentially involved in delivery of care, including emergency departments (not applicable to hospitals without an ED), radiology, anaesthesia, surgery, critical care and elderly care. The pathway should include elements such as referrals between specialties, CT scanning, identification of high risk or deteriorating patients, consultant presence, admission to critical care, assessment of frailty and input by elderly care. It would be expected that the pathway is signed off by the Trust Board, and confirmed to commissioners that the pathway is in place by April 2019. NELA is collating examples of existing pathways. Click here for more information on RCS Standards of Care for the High Risk General Surgical Patient. 8. How can I find out how my Trust is currently doing? At present, NELA provides quarterly reports at hospital level. These may give a reasonable indication of how your hospital is performing. However the BPT is based on Trust level performance (important if your Trust is based over 2 or more hospitals). NELA will shortly be producing Trust level reports which show the BPT metrics (ie high risk patients that have all three of consultant surgeon AND consultant anaesthetist present AND are admitted to critical care). These will also be based on the financial year running from April, rather than the "NELA" year which runs from December. 9. How will data be collected for the BPT, and what cases will my Trust get paid for? BPT compliance is measured through data submitted directly to NELA. 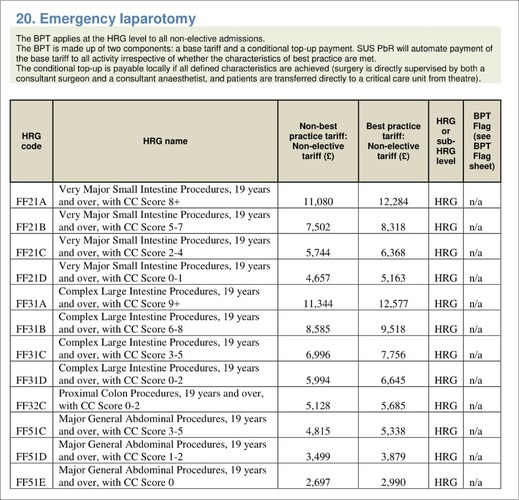 Compliance will be based on performance figures reported by NELA, but paid on a basket of HRG codes that represent common (but not all) emergency laparotomy procedures, regardless of whether these are entered into NELA, and regardless of their risk profile. Commissioners are likely to consider the case ascertainment rates as reported by NELA before approving payment of the BPT. For instance, even if NELA data shows 80% of patients receive the correct care, commissioners may not pay the enhanced BPT if only 30% of cases have been submitted to NELA. 10. What are the deadlines for submitting and locking cases in NELA? The BPT will be paid quarterly. The exact deadlines for submitting cases will be announced once agreed. NELA is likely to amend the deadlines for its own Quarterly reports so that they match that required for the BPT. 11. Who should I contact in my Trust to help with the BPT? Your medical director, and leadership team (clinical leads and general managers) in surgery, anaesthesia and critical care will want to know this is happening, as it may alter the income for the Trust. They may wish to make improvements in clinical services to bring more patients into the enhanced tariff. It is important to note that the tariff for those who DON'T meet the criteria listed will attract a lower tariff than they currently receive. Your trust may want to take note of this and include any potential shortfall in their business planning. 12. What support should I look for from my Trust? Given the financial benefit that arises from the enhanced BPT, we would expect Trusts to provide support to those involved in coordinating data collection and reporting within the Trust. This could include job-planned time for NELA leads, or support from data collection staff, clinical audit or clinical coding teams. (The HRG codes included in the BPT are listed below- these may be helpful to your coding team). The Trust could target the BPT metrics to bring extra income into the Trust. The enhanced tariff could be part of cost improvement plans, and so the Trust's QI/service improvement/ transformation team may be available to help you plan and implement pathway changes. 13. What is the difference in price between the lower and enhanced tariff? This varies according to the HRG codes as shown in the table below. The average difference across HRG codes is ~£700. Hence a Trust undertaking 100 procedures a year may see a potential income difference of £70,000. These codes can be passed on to your Trust finance and coding departments who will be able to model the financial implications for your own Trust. 14. Why has the price differential and the achievement level been set at the proposed levels? This has been worked out by the NHS pricing team at a level that they feel will allow the BPT to function correctly and act as an incentive to improve care. 15. What should the income from the higher BPT be used for? The BPT is intended to support improved services for emergency laparotomy patients. Some Trusts have indicated that they will use the enhanced tariff to support things like increased critical care capacity or to support a business case for improved elderly care input. 16. What is the situation regarding the BPT and the proposed blended payment for urgent and emergency care? The NHS England Pricing Team have stated that there is a commitment for BPTs to sit alongside the proposed new blended payment for urgent and emergency care. Similarly, there is also an intention for the BPT to operate alongside Alliance Incentive Contracts. NHSE intend to provide additional information in December 2018. 17. What is the latest news from NHS England regarding the BPT? There is a section in the above linked document in appendix 1 detailing how the BPT should be treated within a blended payment. This supports local negotiation between provider and commissioner to set a local anticipated future compliance for the BPT within the blended payment. This if possible could be supported by a current provider level rate published by NELA. The aim for the BPTs in an Urgent and Emergency Care blended payment or aligned incentive contract is to continue to support best clinical practice by local agreement, in the case of UEC blended payment this will be by agreeing the achievement rates as part of the contract." 18. What will the NELA BPT Quarterly Reports look like and include? The Emergency Laparotomy Best Practice Tariff (BPT) will commence in April 2019. Once this BPT starts the NELA Project Team will be providing BPT specific Quarterly Reports to assist you. Ahead of this we wanted to provide you with an example of what the Quarterly Report will look like and also provide some indicative information about performance in the BPT in advance of the BPT commencing. The reports below include further information on what will be included in the BPT Quarterly Reports going forward. We are aware of the potential discrepancy between NELA & POSSUM risk scores and clinical judgement. POSSUM identifies a patient as high risk, when NELA and clinical judgement identify the patient as low risk in less than 1.5% of cases. The current report includes this discrepancy, but as it is only occurs infrequently, still means the report is indicative of current performance. What Case Ascertainment do I need to achieve in order to qualify for the BPT? This will be a decision for Commissioners to make, as they will need to decide whether the case ascertainment is sufficient to represent Trust activity. Please click below you can download the Emergency Laparotomy Best Practice Tariff Frequently Asked Questions.